At this point in his career writer/director Quentin Tarantino runs the risk of being a parody of himself. Playing up the most obvious and popular aspects of the kinds of films he tends to make his latest, The Hateful Eight, tends to skirt that line more than a few times, but dammit if overall this is an experience like no other. What is being said? What is the objective? What is the point, if you will, of collecting eight or more disparate souls in a single confined space and allowing them to exhaust each of their personal vendettas against the world on one another? It would seem Tarantino would need to have some type of idea or some larger theme he intends to tackle when setting out to write a project that concerns the relations of a variety of characters shortly after the end of the Civil War. 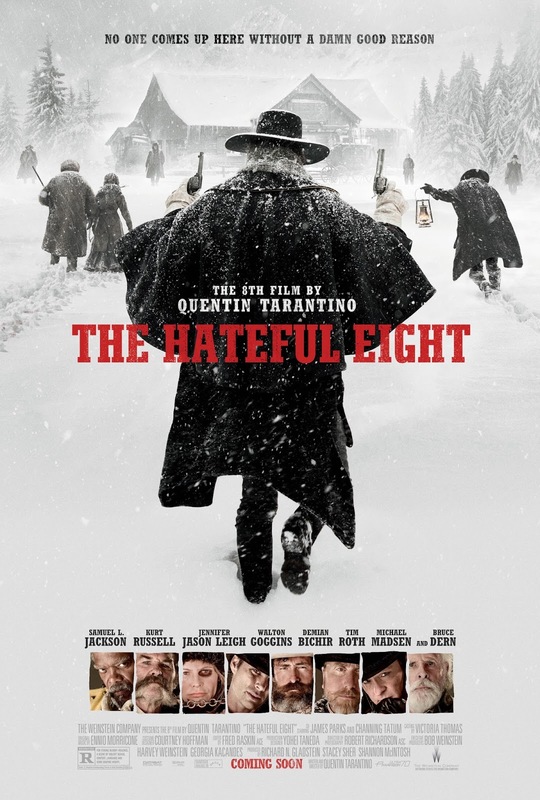 As with his two previous efforts that have addressed history and it's inconsistencies in equality, The Hateful Eight looks to bring up old wounds and address them freely. Unlike his previous two efforts though, The Hateful Eight is not a revenge tale in the larger sense of the genre, but more it is a contained mystery that asks whodunit and has the audience play a guessing game as it holds the answers just out of arms reach until the inevitable bloody end. Of course, the similarities to playing a game of Clue don't detract from the quality of the film as Tarantino goes back to more fully relying on what made his initial films all the more engaging and distinct: the talking. At ten minutes shy of three hours The Hateful Eight is certainly something of a journey, but it never feels like an endeavor. More, the film is an exercise in detailing a portrait of this point in time and the varying perspectives that contributed to the climate of America. By confining these eight very different, very volatile individuals into a single location Tarantino is able to make many statements, but mainly the guy seems to offer the idea that the state this country was founded on and how it came to fruition after we finished fighting ourselves is that of an unstable one-with qualities seeming to still echo into today's society. 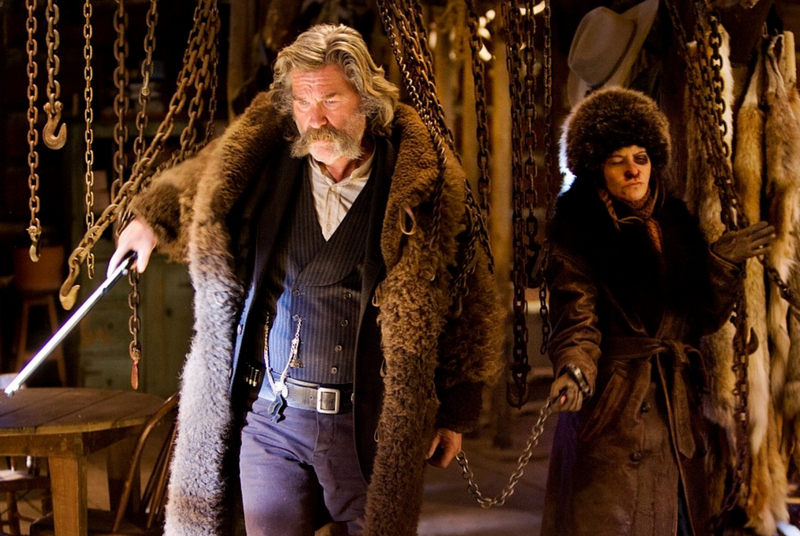 John Ruth (Kurt Russell) escorts Daisy Domergue (Jennifer Jason Leigh) through Minnie's Haberdashery. Per usual, Tarantino has divided his story into chapters. This time we have a total of six and each are told in chronological order with the exception of chapter five. 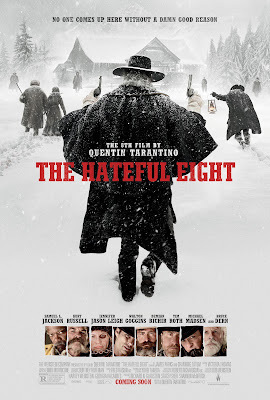 Set eight or nine years after the end of the Civil War in a winter warped Wyoming during the middle of a blizzard we first come in contact with infamous bounty hunter Major Marquis Warren (Samuel L. Jackson) who has become stranded in the blizzard. When a stage coach carrying bounty hunter John Ruth (Kurt Russell) and his fugitive captive Daisy Domergue (Jennifer Jason Leigh) comes across the stranded Major they exchange pleasantries before Ruth consents to give Warren a ride. Both attempting to make it to the town of Red Rock to claim their rewards, the men recognize the fact they won't beat the blizzard. Ruth's driver O.B (Tarantino regular James Parks) then makes his way to Minnie's Haberdashery where his passengers might take refuge. Before they complete this leg of their journey though, the stage coach once again encounters a lost soul looking for a ride into Red Rock. This time, that soul is in the form of racist Chris Mannix (Walton Goggins) who claims to be the new Sheriff of Red Rock. Upon arrival Ruth, Domergue, and Warren are greeted by unfamiliar faces: first there is Mexican Bob (Demian Bichir), who claims to be taking care of the place while Minnie is gone; next there is Oswaldo Mobray (Tim Roth), a British man who also claims to be the hangman of Red Rock which in turn makes him and Ruth something of business partners, then there is Joe Gage (Michael Madsen), a man who claims to be a cow puncher, and finally there is Confederate General Sanford Smithers (Bruce Dern) who's made his way to Wyoming to find the resting place of his oldest son. As the storm overtakes the mountainside, these eight strangers come to learn more about one another than they initially bargained for revealing layers of distrust and coincidences that may not actually be such. It is through each of these characters that Tarantino intends to both provoke the bigger ideas he is playing with while at the same time delivering the traditional or expected types that populate a Western. As the closest thing to the lead of the film, and easily the most charismatic character on screen Sam Jackson is also seemingly intended to be the hero of our piece. After all, if you've been paying attention to the news lately you've seen that Tarantino himself displays a passion for the mistreatment of African Americans in our present culture and the placing of the sole black man in the heroes slot clearly identifies the statement the writer/director wants to speak on. As Major Warren, Jackson is superb. As a frequent collaborator of Tarantino's, Jackson can handle the director's dialogue like no one else and he discharges each line here as if coming from a position of both defense and entitlement. Of course, at that point in time African Americans were certainly entitled to more than just fair treatment, but Jackson's Major Warren was a celebrated war hero, a soldier for the Union thus making his entitlement all the more inciting to the likes of Mannix and General Smithers. In the landscape of how these characters represent the beginnings of America's still lingering issues Warren is the black man who is still discriminated against despite his accomplishments, Mannix is the privileged white boy who is given a position of power based on nothing more than lineage, Smithers is the crotchety old man no one can stop from spouting racist remarks, and Domergue is the portrait of the woman. While others such as Russel's Ruth is the traditional hero of such a genre piece (Russell's performance is fine, but his character is the least interesting in this scenario), the likes of Bichir and Roth simply exist to symbolize the position of those south of the border and those across the pond at this point in time. Madsen's Gage is the most interesting of these outliers as he seemingly stands to be the middle class. The innocent party simply looking to make an honest living and go on about their business, but who somehow became wrapped up in the wrong place at the wrong time. Without going into spoilers, it is interesting the fate of these characters as one could see the analogy essentially fall apart, or to go further, it could be seen as a greater statement of America's own ignorance despite the consistent hints from those we believe to be allies. Oswaldo Mobray (Tim Roth) and Chris Mannix (Walton Goggins) face off in The Hateful Eight. The portrait of the woman is both the most intriguing and the most mysterious-no doubt the former because of the latter-in the film. Though it becomes unclear what exactly Tarantino is trying to say by the end of his exercise in the sadistic is unclear that Leigh as Domergue serves to be the catalyst of the events that unfold at Minnie's Haberdashery while speaking the least of all her counterparts makes the director's point all the more apparent. While the fact we learn most of what we do about Domergue from the mouth of Ruth and that Ruth, the keeper of her fate, doles out what he sees as necessary punishment when she gets out of line is a comparison that undoubtedly (and unfortunately) hues close to many a modern woman's experiences in their professional and likely even personal lives. As Domergue, Leigh makes the outlaw as vile and unforgiving as she possibly can and yet we as an audience are attracted to her. She, along with the rest of the cast, use the N-word abundantly and it's made clear she deserves the fate she's headed toward as well as every black eye and any other form of mistreatment she receives along the way, and yet there is something about her, something we can't necessarily glimpse, something maybe we're not meant to understand that gives way to this attraction to the character. The image of Domergue late in the film, her face soaked in blood as if a nineteenth century Carrie, paints a fuller portrait of everything she's been through and had to put with in order make her mark-not all of it being pretty. Whilst Warren is the presumed hero of the story and Domergue the villain, Tarantino is clearly keen on charting both of these opposing arcs through the white men standing between them while not so subtly hinting that these truths are still relevant today. 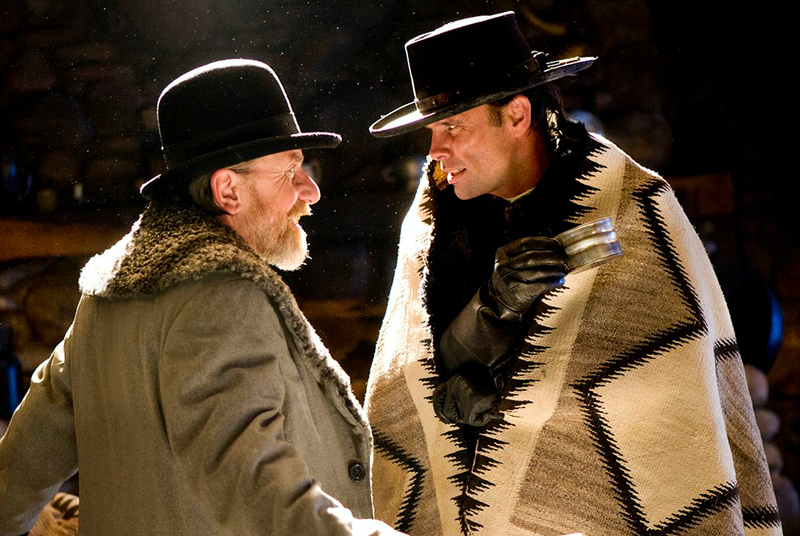 As a piece of entertainment, The Hateful Eight is appallingly charming in that it's hard to not want to remain enclosed with these bastards for as much time as we do, but even so the film tends to go on for a touch too long-especially in its final two chapters. Goggins as Mannix is especially fun to watch despite his horrible disposition on things in general. Every ironic line that is meant to be un-ironic is tinged with just enough humor to make the character endearing while never letting on to whether we, as an audience, can actually trust or believe a word that comes out of his mouth. There is a running gag with the door to Minnie's Haberdashery that is genuinely hilarious and plenty of dialogue throughout that I wanted to write down and log away based simply on the ingenious quality of the way Tarantino worded certain expressions. And while I generally loved the film and all that occurred, all that was said, and the idea of using as wide a frame as possible to tell such an intimate story my mind kept coming back around to the objective-the point of it all. Tarantino opens with an extended shot of a crucifix. Being Catholic, I know the crucifix to be a symbol of sacrifice, one that is a constant reminder that death was accepted by one individual so that we may be allowed to live. It would be too simple and obvious to draw a comparison between this symbol and the main theme of The Hateful Eight, but maybe that's just what Tarantino is saying in the broader sense of his convoluted metaphor: if we all sacrifice something, maybe even the slightest bit of our ego, everyone else-especially those still treated with prejudice (whether in race, gender, or class)-might be able to live a little more.